All the rage these days is straight hair. Unfortunately for me, I have that half wavy, half straight, super frizzy long hair! The people at the Flat Iron Experts are just that, experts. 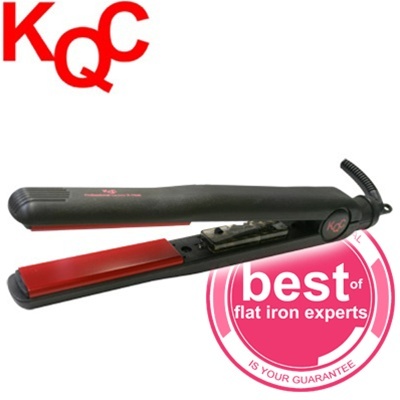 When I had asked for what would be the best product for my hair, they recommended the high heat KQC iron. This iron has tourmaline plates that super heat to 410 degrees in just 30 seconds. The negative ion technology penetrates the hair shaft and anding volume to the hair while smoothing. Cool huh? When I used the KQC it did indeed heat up super fast. Anything that can make my hair routine quicker is welcomed by me. My whole head was soon smooth and silky and stayed that way all day. A swivel cord kept the cord from knocking over everything and not strangling my neck while I maneuvered to the back of my head. Right now this flat iron is $90 off the original price!! Check Flat Iron Experts on Facebook.